"The story that has lived in our hearts for generations, now comes to the screen for the holidays." 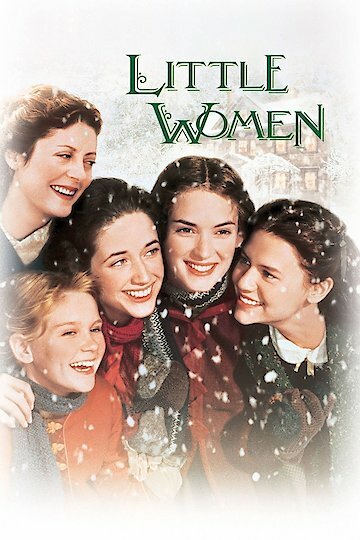 Little Women follows the lives of four girls, the March sisters, growing up in the north in the Civil War era. While their father is away at war Meg, Jo, Beth, and Amy are left in the care of their mother Marmee, who helps them with their problems and encourages their talents. The oldest and prettiest, Meg, plays a mothering role to the rest of her sisters and cares for parties and boys. Jo is a creative and impulsive tomboy, writing plays she has her sisters acting in and often railing against her family and her situation in life. Sweet Beth is quiet and loving with musical talent and no ambition to leave her family home. The youngest, Amy, is spoiled and prone to tantrums though she mellows and becomes an artist when she is older. Through their adolescence and young adulthood the girls have to deal with many trials and tribulations. They make a life long friend of neighbor Tedd and are overjoyed when their father returns from war. Three of the girls find love; Meg with a teacher, Amy with Teddy, and Jo with a German professor. The March family is also stricken with tragedy through their lives when young Amy nearly drowns, their father is wounded in war and, later, when Beth dies of scarlet fever. Individually Meg faces disagreement with family over her pending marriage and Jo is disappointed to be denied a trip to Europe. She turns down a proposal from Teddy before she runs away to New York, trying to find herself. The three remaining March sisters all earn their happy ever afters away from home. Meg marries and becomes a mother. Jo finds the man she loves, publishes a novel, and opens a school. Amy has the opportunity to study art in Europe and eventually marries Teddy, becoming his reason to better his life and get over Jo. Little Women is currently available to watch and stream, download, buy on demand at Netflix, Amazon, Vudu, Google Play, FandangoNow, iTunes, YouTube VOD online.